Reviews | Choice 3 Tray Bakery Display Case with Rear Doors - 21" x 17 3/4" x 16 1/2"
Use this Choice 3 tray bakery display case to make sure all of your prized pastries are presented in the most tempting way! The clear acrylic construction on all sides provides excellent product visibility for a clear view of your bagels, donuts, and other sweet treats from all angles. Three clear trays are included so you can display products on different tiers, while adding height and dimension to your countertop. The sliding trays can easily be removed for quick cleaning. We use a couple of these cases at the farmers' markets we sell at and they are very sturdy! Others have not held up as nicely. Not only is this case great for displaying your delicious baked goods but it's a great value when comparing price and quality. The size is good for a small counter space. The only complain in the instruction sheet which is photocopied and hard to read. Also the instructions can be confusing. Be prepared to spend at least 30min to assemble this case. The magnet to hold the doors may need adjustment, Also the doors were not aligned and there is no way to adjust that. With limited space in my tiny new bakery and only one high counter to work with for displays, I needed something that would show off my baked goods well and be reasonably priced. The Choice 3 tray display was the right choice for me. I have two displays side by side on my high counter that I can easily access. I like the clarity and sturdiness of these displays. Out of the box the pieces were a bit staticky and tiny bits of styrofoam were everywhere, but after a little clean up they are bright and clear. Assembly isn't bad if you take your time and line the pieces up properly. Compared to other cases, these are definitely a bargain and that is just what I needed for my new business. A tip: I put a piece of Contact Beaded grip under each display for a little extra cushion and stability for my counter. Looks great! It's sturdy but lightweight enough to move from event to event. The only problem is that the screws provided to attach the handles don't actually fit. It's not a huge problem since the doors aren't for customers (they're in the back), but they're loose using the screws in the kit. Three tray bakery display case. Perfect for my convenience store that I want to display my items but I want to serve them to my customers. I own several franchised cookie stores (Great American Cookies) and we use these cases at times to sell some of our cookies out of. I've purchased two in the last two years and decided to purchase another this year. This third case I purchased was from Webstaurant and the case was manufactured by choice (my other two were not made by choice). Unfortunately, the shelves are not wide enough. It's hard to explain, but if you don't exactly slide the shelf into the case in the exact center of the brackets that hold the shelves, the shelves will fall. Either the case should be about 1/4 inch narrower or the shelves should be 1/4 inch wider. I am pretty disappointed in this case made by Choice and will not purchase another made by them. I'll be going through old invoices to see who made my first two cases and purchase future cases from them. Oh, and I have no idea in the world how this "flaw" in manufacturing design could have passed quality control. Sorry to say it, but I would NOT recommend this item! We appreciate your review, Paul. We are sorry this display case arrived damaged, our Customer Solutions team is assisting you in getting a credit. I have only had the case for about 2 weeks, but so far, so good! I searched for quite a while for a case that was in my price range that also fit my needs (back door, 3 shelves, removable shelves). All pieces came in the box, nothing was scratched, all screws were included. It only took a 19 yr. old girl 20 minutes to assemble! The doors close with little effort. My only complaint...I do wish that the handles were lower on the doors (nearer to the magnet strips)-This was a design/engineering problem. I read some bad reviews on this item, but I only have good things to say. This was PERFECT for what we needed. We used to individually wrap each baked item but bought this and have doubled our baked item sales. It looks so nice on our counter right next to our dispensers of fresh brewed coffee. It has paid for itself in just a few weeks! After getting quoted extremely high amounts for bake cases, I found this one that was so much more affordable. It works great, looks nice, and the rear doors make it look more professional. I love this display, the customer can really appreciate the product without even opening the doors, big enough to hold many many pastries but still nice size for your counter top without taken much space. We love this case for our vendor events. The first one I received was cracked but customer service quickly sent out another one for us. It's light and sturdy and displays our treats well. This case is good for the price. The first one I ordered arrived with a couple of broken pieces so they replaced it. It takes a few minutes to assemble but overall, not too bad for the price. Awesome product. Very easy to put together and use. Great presentation and very durable when cleaning the item. Had problem with shipping but was resolved fast! This case is exactly what I was looking for at a great price. Holds a decent amount of pastries and looks great on our countertop. Bought this to display baked goods at farmers markets. The case is functional and does what it is made for. The screws that hold it together back out through normal use even after several fixes. Assemble with some glue on the threads to avoid losing parts. As a stationary display I'm sure this won't be an issue. This is a perfect description of this item and I was extremely happy with the results of this. It is really simple but it can also be classy. This bakery display case is a great product. The trays slide in easily, it is in general quite sturdy, and provides plenty of space for bakery items. Even though the instructions were a bit vague, putting it together was easy. This worked well for us but was difficult to keep clean. It seemed to always be "streaky" instead of really clear. I tried using it for farmers markets, and it was a little bulky for constant travel, so it is probably best for a place that keeps it in one spot. Love this display so much! It makes everything look super professional and is a great size for traveling to different events with. I love that it has rear doors and is super easy to assemble. It is such a beautiful display and would recommend it to many people! The build quality is ok but it definitely is a bit rough around the edges, many of the holes didn't perfectly line up so there is a bit of forced alignment but overall it does its job. Unless I was on a tight budget I would have preferred a higher quality one especially since the screws on the handles tend to need re-tightening more often than I would like. While this came with missing screws (I'm feeling like it had been previously opened and not fully repackaged to include all the parts) it looks very nice once assembled. Assembly is a two person job. I use this for a small markets and it's a bit clunky to haul around. We needed some extra space for our baked goods, but are very limited on space. This product was the perfect solution. It sits right on top of our existing case and blends right in. With not being able to order another floor case, this is perfect. Have already ordered a 2nd one. Love the fact that the tray come with it and are not an extra charge. We never used a counter-top bakery display case before and didn't want to spend too much money on one. We are a traditional German delicatessen and would typically put our limited selection of bakery products on the counter right in the baking pans. That presentation probably is more "appealing" since it looks fresh-out-of-the-oven, but it does takes up a lot of counter space. This display case is not a big unit, so we use it to transfer our baked items when the pans sell down. Works well for us. Decent quality, although you have to be careful when moving it around to clean underneath. It can crack easily. This display is perfect for baked goods! I love how easy to clean it is. Only took 15 min to assemble. People always comment how professional it looks. Trays slide nicely! Can’t go wrong with this one. Worth every penny. this display case is beautiful! i have used it for cinnamon rolls and cupcakes and it just makes a beautiful display for whatever you decide to put in it. This is a nice case for the price. You do have to be careful of the hardware because the screws do come loose at times and the trays are fragile. I use this display every single week at my farmers market! It beautifully displays the cupcakes and allows the customers to clearly see the product while keeping hands, dirt, and bugs off of the products. This is one of the smartest investments I have made and gives the table such a professional look. We got this display case for pastries and bring it to farmers markets. It is light enough to carry around but also sturdy and professional looking. The trays remove easily for cleaning. Beautiful display case to show my products in. Easy to assemble. Arrived with a little scratch but problem was solved in a matter of minutes! Great customer service and Great products! Perfect for my cupcakes , etc for display at the Farmers Market. Very professional looking and quality product. I purchased 3 of them and they holds A LOT of cupcakes and all my other sweet treats! I would recommend this product. I had very little trouble following the directions to assemble it. The trays fit as they should. Customers have commented on how much better my bakery shows off in comparison to the cake plates I had been using. My only "complaint" would be how easily the plastic scratches. It was my own fault, but my screwdriver put a 3 inch long scratch right in the front of the display. Also, I used the usually dish scrubbie to wash the tray and it got scratched. We only use a soft cloth to wash those now. Also, it trays are slightly wider than a 1/2 sheet pan, so it doesn't really fit on other racks for storage. This case is comparatively cheap, and things look good on the trays. the only real downside is that they trays break easily, so get a couple extra while you're at it. This showcase is aesthetically pleasing and easy to clean. The clear sides allow for customer viewing from all sides, though without plastic cleaner, the trays are easily scratched. Great, heavy duty display. Easy to put together. The inside trays are easy to remove and are great for easy cleaning. The all clear case makes it easy for guests to see what food items are on display. Unfortunately, you get what you pay for. This is one of the cheaper display cases that can be found online and it sort of gets the job done, but is prone to cracking and the pre-drilled holes for screws don't altogether line up properly. This should have been better than it was. The assembly etc was easy enough, but the sides tended to bow out - a bad feature in something where the sides being straight is what holds the trays up. They tended to fall out under weight until I had to reinforce it with some glue and a dowel across the tray rack. This Pastry Case does the job of displaying my baked goods. A few scratches here and there, but I think this is with any plastic display case. This bakery display case does a fantastic job of selling our goods. It is built sturdy but must be protected from bumps and bruises because it is plexiglass. Pay close attention while assembling it to make life easier. We do farmers markets and it travels well. Thank you for your review, Dan! We are sorry this Choice 3 Tray Bakery Display Case with Rear Doors - 21 inch x 17 3/4 inch x 16 1/2 inch has not worked well for you. A Customer Solutions Representative will contact you soon! I was concerned when I placed the order for this unit that it might be too small. Once we received it and set it up, it was perfect! It holds a lot more than I had imagined and is a great attention grabber as customers stand right in front of it when placing their orders at our counter. It is very easy to see our products inside and is already bolstering impulse buying sales. It is not the strongest nor best built display unit, but for the price it was worth the money. We will just handle it with care and not slam it around. We expect it will last just fine. Great display case. We use it on a daily basis for a variety of things, and are very pleased with it. The case racks are tilted so that the customer can see everything in the case. It is easily cleaned as well. Easy to put together and easy to use! They help give my products a very professional, clean presentation. I've gotten many compliments on how nice they look. They're great!! We use this display case in our ice cream parlour to display cookies, brownies etc. The doors allow for easy access to the baked goods, while allowing customers to view the items. This is perfect for our little coffeeshop-bookstore!! And the proce was AMAZING! Much more affordable than all the places I searched - and I searched everywhere! This bakery display case is appropriate for its cost. It is a bit wobbly, which I remedied by "glueing" it together with clear silicone. The alternatives were dramatically more expensive, so I would buy again. I got this 3 tray bakery display case for the craft fairs that I do. I make Handcrafted Cupcakes and this has displayed my product beautifully and I have received so many compliments while using it! This has been the greatest display case. I use it for mobile events and it has remained sturdy and easy to keep clean. It is also light enough for one person to carry. Filled with my cookies and other goodies, it adds so much visual appeal to my booth. We used these display cases for our annual Greek Fest in Madison. They were easy to assemble, looked beautiful for our bake sale, and probably most importantly they cleaned easily! They look brand new after each use. Will order more as we expand!! We love the display case. Customers can easily see what is available and it looks great. Would highly recommend for anyone needed an affordable way to display their treats. This is probably the best trey you can have for a store if you are trying to sell cookies and other food items great for show and cheap prices! This case broke (for the first time) on the very first day that we used it. The middle shelf would never stay in place and would fall down onto the shelf below it, the doors would always misalign to leave a gap so that it was never shut. With a lot of patience, we were able to make this case work for a whole year, but that was only because we couldn't afford to buy a new one yet, and the minute we could, we got rid of it. It's unfortunate that this is one of few options for bakery display cases that is a reasonable price, because it was aggravating on a whole new level, and we didn't have any options. We appreciate your review, Corey! We are sorry this bakery display case did not meet your expectations. If you have any concerns with the product you purchased, please contact our Customer Solutions team as soon as you see the problem. Great display! We run a small dairy farm and allow locals and travelers to stop in and buy fresh milk, from our goats and cows so we decided we could complement our dairy products with pastries so now our daughter makes fresh donuts, croissants, and other great stuff and they look very appetizing sitting in this display. Perfect size for the counter! The the way this looks and functions. I was short on bakery today so I threw some bagels in there. It is a nice way to keep customers from trying to lift up glass cake dish lids when your back is turned making coffees! This display case is beautiful! Crystal clear to showcase my baked goods. It was easy to assemble. I couldn’t be more pleased with it. Last weekend I used it at a craft fair and filled it with cupcakes and brownies. Everyone commented on how nice it was! Great product! Good quality plexiglass display. Very good price. Provides an attractive method to display pastry goods in our coffee shop. Would recommend this product. Very pleased with this purchase. This is a great looking display case! We love the smaller footprint as it fits perfectly on our service counter. It can be a bit frustrating to put together. This is a really nice case for the money. It wasn't hard to put together at all with two people! Definitely will be ordering another one soon! We had an old cookie display box which wasn't as transparent as this. Having this book display case led to selling more cookies, which come as a side for our restaurant. I really like this Choice 3 tray bakery display class. The directions aren't much help but my 17 year old son was able to figure it out and put it together by himself in about 20 minutes. It is larger than I thought it would be but that just means it holds more. I filled it with French Macarons and loved how it looked. We appreciate your review, Cassandra! We are sorry this display case did not work meet your expectations. If you ever have any problems with the product you have purchased, please contact our Customer Solutions team. This bakery display case is beautiful and very high end looking! It was easy to put together and perfect to store our baked goods and other bread items. The only reason why I'm knocking a star off is because one of the hinges was damaged. I've already contacted customer service about this. But because I didn't notify them within 5 days, they will get back to me with a solution. If I receive a satisfactory solution, I will up the stars to 5 stars. This display case is great for small to medium sized cafes who have limited space to display your baked goods. The instructions for putting it together are clear, and although it can be assembled by one person, it might be handy to have someone else nearby to help hold up certain pieces while you screw them in. I love this display case. It opens from the back which I like because my employees handle the products wearing gloves and I do not have to worry about the customers touching the food and contaminating them with any germs. I have one in my cafe and also buy them for each of my wholesale clients so they can display my pastries in their store! Everyone is very happy with them - it really draws the eye to the baked goods inside and it is great that it can sit right on top of the counter next to where I ring customers up. In the unlikely circumstance that they did not see it before they came up to the register they definitely notice it while they are paying and it almost 100% of the time results in another sale! Our display case sits on our countertop, filled with homemade donuts (sometimes) , cookies, turnovers and muffins. I lay waxpaper on top then make a nice pleasing to the eye display of sweets. AMAZING! I love these cases. i put them together myself- and it took my 20 minutes. So easy to assemble and my french macarons look great in them! Love this case. I use for all my dry pastry. And its bery sturdy and looks nice at front counter. May be ordering one more! I love this display case. I do farmers markets with my cupcakes & it displays them really clearly, even in the rain. The first case I received had a defect but customer service dealt with the issue quickly & efficiently, sending me out another right away. Really happy with the case & the service I've received. Great little display case. It was perfect for me to hold my macarons. The only negative I have to say about it is that the material sticks to things very easily like dust, hair, etc. but Other than that, it's good and simple display case for me. I just purchased my new donuts shop, and was looking for a displayed case. I came a cross this at webresfurant and this display case is perfect. Not too small and not too big. The 3 tray bakery display case is wonderful to display our Pastry Goods. It's very sturdy easy to clean and opens from the back to easily get to Products. GREAT!!! we have 3 in the bakery! Such a good value! We hold up to 3 types of desserts on each tray! Get the expensive feel of a display case without having to actually invest in a full glass display case! We appreciate your feedback, Marvin! If you ever have any questions about the item you purchase, please contact our Customer Solutions team at your earliest convenience. We use this bakery display case to show off our chocolates & cookies! It really helps keep the products fresh too! It's so well built & easy to keep clean. Quality is there and easy to install. Recommendation would be instructions.. it's very straight forward but it might be hard for some people to install because they do not show any pictures.. also you screw driver and adjustable wrench. This Bakery display case is a great product to display your baked goods in the store. It really enhances the beauty of the already appetising looking yummy treats in our store. I would recommend this product to all bakery owners. We use this cute little case to display our baked goods at our cafe. It holds a decent amount of goodies, perfect for what we do. I'd say it can hold about two dozen cupcakes/muffins per shelf and about a dozen bigger goodies, like cinnamon rolls and/or sticky buns per shelf. Pretty good quality, but not air tight. I'm giving this thing five stars because of how functional it is. I'm tempted to give it three stars because the little nuts and bolts that attach the doors to the rest of the case always fall out... but if you have the patience to replace a 15 cent nut/bolt every month, then this case is the perfect value. I just stock a few nuts and bolts of the appropriate size so we're prepared. The Choice 3 Tray Bakery Display Case with Rear Door is a very sturdy product for the price and allows only staff to access the product line when selling baked goods. This display case was easy to install and is easy to transport. It does not fit in a standard storage bin though you will need one slightly large than the normal one. The doors are a little off like other people have said but I have yet to get a fly inside my display case. This case has made my business look more legitimate which has only increased my sales. For the price I would definitely buy this product again. We quite like this product! It displays our baked goods wonderfully and we love that we can pull out the trays/shelves to wipe them down or place food on them easier. The assembly was a little tricky, because the instructions are terrible but the actual design is straight-forward. Overall, great product. I own a small bakery and this is prefect for the display of cupcakes an cookies! I have it full on a daily basis. IT was easy to put together and instructions were very clear! Doors swing open without a problem and it is just an all around perfect display case! I will be purchasing more! I have been extremely unhappy with this product. I bought 4 of these for farmers markets and they did not hold up well at all. All of the screws on the outside fell out and needed to be replaced with better screws. The shelves do not stay in place and constantly fall down when you put any products on them. We have to try and put thick tape on the shelves to keep them in place. These will not be usable beyond this market season. I am very unhappy with this purchase. Thank you for the review, Michelle. We really do wish these would have better suited your needs. A Customer Solutions Representative will contact you soon. A beautiful display that helps make my Farmers Market table look more professional. It has very clean lines, as well as being easy to clean up. I think my only complaint is the photo copied directions, those pictures were impossible to see clearly. It's common sense putting the thing together luckily, since those instructions were no help. Used on our table at our local market. It looked very professional, we are very pleased with this product. Was easy to put together, plan on purchasing again! Great case specially for a deserts. We are using ours for our kolaches. It's easy to clean and make every product looks great. We also appreciating that it doesn't have front access. This has been a great product at our food and ice cream shop to display our home made brownies, bags of potato chips and bananas, Very durable and easy to clean. This was a great buy! Needed something nicer for my cinnamon rolls at farmer markets and am very pleased with appearance & construction. Had some issues with the shelves but Webstaurant customer service fixed quickly! I love my dry case. It hold a lot of product. It's easy to clean and was easy to assemble. Definitely would recommend this item. Great way to display pastries while keeping them fresh. The magnetic doors are nice because it makes them harder to leave open. Be careful not to over-tighten the screws when putting it together or the plastic might crack on you. Purchased this item for our Sweet Friday's at my Office We Sell Out Every Friday Looks very professional and holds a lot of items ...We Love It Thanks For Everything!!! Absolutely love my 3 tray display case!!! Excellent quality, in the processing stage of opening but I'm sure my customers will love my presentation of goods. We bought this display case for displaying muffins and bagels at our coffee shop. I have been very happy with it. It arrived in good condition and the assembly was easy. We have been using it for nearly a year and it has held up very well. It has some minimal scratching on the plastic from every day use, but nothing major and nothing that diminishes the usage or looks in any way. Very happy with this product! This display is easy to set up, comes with instructions, you will need only a star screw driver to assemble. Looks clean and the space between trays is perfect for bakery pastries. The product itself is great. Very durable and nice looking but I had a few things that I was not happy with aside from the poor customer service at Webstaurantstore.com. First, the doors on the bakery case do not line up properly. Now bugs, dust, etc can get into my bakery case. Also, the directions were very poor for putting the unit together. I hope Webstaurantstore.com follows up on this review about the doors as they should be lining up properly but they are not! Thank you for the review! We're sorry you felt that this was difficult to put together. We are currently working on updating the instructions and hope to post them to our site soon! Purchased because we needed something to keep our cookies & cakes. The instructions weren't to clear, so we had a difficult time trying to put it together. However once it was put together it looked great on the counter and worked good for the purpose. Love this product. Very easy to assemble and the sliding out trays make very easy for cleaning. And the perfect wide front display shows off your deserts to look fantastic! This case is PERFECT for displaying baked goods in our coffee shop. We don't specialize in baking, but this does a really great job of displaying what offer really well. I absolutely love this bakery case. It is strong yet portable which is useful for a Farmer's Market bakery. It is made of crystal clear acrylic which cleans easily. I liked it so much that I ordered another within a few weeks. Good quality with rear doors which make it easy to serve yet prevents customers from handling the bakery items. Ordered this to use at trade shows. It's perfect! Worked great and everyone kept telling me how professional my booth looked. Ordering a few more for my new store front!! Love the look and durability of this product. Great for displaying any type of food for a professional look. I would recommend this product to anyone. This Choice 3 Tray Bakery Display Case is a great solution for displaying your baked goods. The acrylic cleans up really easily for a great presentation. I love the cases I only wish I could get parts for them. The hinge has a rod that has fallen out, after repeated use. I am unable to now use the cases. This three tray bakery display case was the perfect addition to our concessions counter! We use it to market muffins, cupcakes, loaf cakes, and pretzels! When we added the case, our muffin sales tripled! It looks great! This is a very good, sturdy display case. It is very large with 3 large display trays. I like it and would recommend buying it. This case is super easy to put together , decent quality for the price ! Easy to clean and looks awesome on the front counter! First of all, I give Webstaurant's customer service 5 stars! I couldn't be happier with the attentiveness by Sarah Krauter! She handled my complaint with the utmost professionalism! On the display case...I received the first one and the bottom piece was broken at the bend. (see picture). Also, one of the handles didn't line up with the holes. I emailed customer service and a replacement one was quickly sent. The second display case has a crackle in the acrylic in the same place as the first one. To me, it seems like either a packaging flaw or a design flaw. However, the piece is functional and is currently being used without a problem. Thought this item would be sturdier and of higher quality. It scratches quite easily, and it's difficult to get access to screw all the parts together during assembly. You must make sure that they are screwed as tightly as possible, otherwise the whole case becomes undone. Great product at a great price. Our order arrived quickly and the product was very easy to assemble. Will definitely order this item again soon. Goregous display case, holds quite a bit of product and easy to move around. Buyer Beware: the instructions to assemble leaves much more to be desired, VERY VERY vague and some steps are already pre assembled (which is confusing) and layout all your pieces and your screws and nuts. We were shorted the four screws required to attach the handles (we needed it immediately for a fundraiser and couldn't unassemble and return to Webstaurant and wait for a new display case, so we use a butter knife to open it off the magnet) but strangely they gave us two very very long screws that CLEARLY does not belong to the display case instead. Impressed by the product itself, but not by the company's directions and lack of quality control. Thank you for the review, Kisha! We're sorry you found these directions to be incomplete. We are working to get these updated to alleviate any difficulty customers might have with them in the future. This was delivered very quickly. It was fairly easy to assemble. We use it for donut displays at the farmer's markets and it looks great. Good quality display case at a great price. It's easy to clean and makes accessing the baked goods very quick and easy. The removable shelves make altering the display even easier and allows flexibility when deciding what product to display. The look of this product is great and would really be a good item if mine was not such poor quality. Mine must not have been cut right as nothing lined up perfect, and because of this the trays barely stay in which is terrible since they are holding up cupcakes which can wrecked easily. Also because nothing lines up and its not sturdy my sides actually got two cracks in them after being used one time. I would not purchase this again because of the quality. Thank you for the review! We are sorry that your bakery display case seems defective. A Customer Solutions Representative will contact you about this soon to make sure you receive a replacement. I have mixed feelings about this case, very nice looking and sturdy case, easy to assemble and very good quality for the price. However there are three trays that slide in and out, the top and bottom work fine but the middle falls off the tracks when sliding in and out. I cannot explain how helpful this product is. I started my bake sale a couple of months ago and this product is so useful and helps me be more organized. It's also very appealing to customers!! Perfect little display case. I have used this now for about 2 months, and cannot really see much wrong with it. It was easy to install, and it has held up so far. The only little downgrade on the ranking is due to one of the shelves not fitting snug in its grove. 2 are perfect, but the 3rd one is a little lose, but does impact the use at all. This item is unbelievable for the price! As a new business I was so excited to be able to find a good quality display case and such a great price. The quality and price of this case cannot be beat! I love this cupcake display. I received much more business after I bought this. It is really nice and big. I say it can hold 4 dozens or more. LOVE LOVE LOVE!!.. Looks very clean and professional. It came with a slightly broken bottom but we fixed it with some glue and no ones the wiser. I was so exited to receive this product since it was exactly what I was looking for and had a great price but when it arrived the instructions were missing pages (it skipped the most important pages). There is one hole that doesn't line up and now my case is tiltedand doesn't close correctly. Thank you for your review! We are sorry you had issues with this bakery case. A Customer Solutions Representative will contact you shortly to resolve the situation. A flexible and attractive display option. Good for presenting various pastry products, and it's fairly easy to modify for different applications. Keeps goods inside fairly fresh as well. I love this product! It was easy to assemble and is relatively light for when I transport it to all my different markets. I like that it is clear everywhere so my customers and potential customers can view the contents without being right in front of it. I ordered the first case and waited patiently for its arrival. Once it came we opened it up for assembly and there were deep scratches on several surfaces. I called and the great customer service sent me another case out. Opened it up and was disappointed to find yet another scratched up case. I again called customer service. Spoke with a great rep who promised me they would have someone go to the warehouse and open up the next case to insure there was no damage. They also overnighted this case as I needed it for my launch that Saturday. I get the case and guess what? Still scratched! Ugh. Hubby and I put it together using pieces from all three cases. I still have e some scratches but I'm learning to live with them. Overall the case works great. Maybe I should have just taken the $10 store credit and stuck with the original one. Thank you for your review, Karmen. We are sorry to hear that these bakery cases have arrived with scratches. Our Customer Solutions Team was happy to help you in any way possible. Love this case! It's the perfect size and very lightweight, so it's easy to move. The material is very easy to clean, the drawers slide easily, and there's plenty of room to reach in with disturbing other items. It's a great product! I purchased two of these cases to take to markets to display our cookies and cupcakes. The cases provide a good amount of space and look great when filled with product. The issue I have is that one of the cases came damaged with a broken door hinge. Webstaurant customer service, which is excellent by the way shipped me a replacement case. The second case came damaged with the identical hinge broken. A third case was sent and this one had the same broken hinge. I was able to assemble a second working case using all the parts but to have three out of four cases come broken is pretty sad manufacturing quality. Thank you for your review! We are very sorry to hear that the display cases you purchased were damaged. We will look into this issue. Our Customer Solutions team was happy to assist you in any way possible. Great case. Perfect for micro bakeries or small cafés. Will definitely fit at least one dozen standard size cupcakes on each shelf. Crystal clear and very easy to assemble. Ordered two of these display cases. They where short a few washers I had to go to the local hardware store to find them. The packaging is a pain, the styrofoam is very staticky as you need to chase little styrofoam balls all around. I didn't realize they came with the trays so I ordered extra. I searched awhile for a good display case to keep my baked goods in. I finally settled on this particular style and I am very satisfied. Holds my items and cleaning is a breeze. The Choice 3 Tray Bakery Display Case with Rear Doors works great at the gas station, it allows customers the ability to self serve their items and it looks great. I have three of these bakery display cases...absolutely love them.....this works out great for my small business....great price for any business just starting out. Shipping is very fast as well. This display case is great.Very easy to assemble.The acrylic is crystal clear that showcases your product to the max.Your product will also remain fresh in this closed case .I have people asking me where I bought it from. We have two of these already, getting ready to purchase another one. They hold baked goods very well, clean and beautiful in appearance (not to mention sanitary)...they do streak while cleaning but I think that has more to do with what we use to clean them rather than the item itself. Great buy. Very good product, it helped to show off our fresh products and it was easy to make sales. It's a very high quality product, i highly recommend this product. I love this bakery display! It showcased my cupcakes beautifully as well as keep them fresh. Easy to assemble and the portability is a plus to me. Great little case at just the right price for a small little coffee shop! Can't wait to fill it every morning, and cleaning is a breeze! Everyone can see each item displayed clearly. Easy removal of the trays during rush, to add more items. Cleans easy, and not difficult to assemble. This was one of the first items we purchased when we started our new business. It was the perfect way to display our yummy treats! We ordered 3 of these and they are awesome! great and fast shipping! We love it! Will order more! It is commercial grade, not tacky and very sleek looking. Thank you webstaurantstore for the great service! I used this for a local festival to display my treats. People loved to be able to see everything I offered. I actually gave out your website and product name to most of my customers. Will definitely be getting used many many times in the near future. love it. I compared to others from other site and this by far was the best deal hands down. 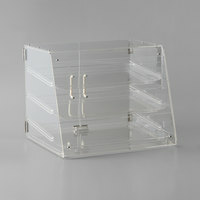 We have purchased 2 of these display cases. They started out for use at Farmer's Markets and events. The product looked great yet was protected from the environment. We have since started using them as feature cases in our store for new fudges, chocolates or specialty bakery items. The display is beautiful, and it makes my goods look even better, it's perfect for displaying all my products at the farmers market!!! It's also very easy to assemble!! Beautiful! my customers always compliment how cute they are! The display cases are also very easy to clean. the acrylic is so clear I had a customer try to grab a roll until she realized it was behind the acrylic panel! Beautiful display cases! Everyone loved our display at a recent event!Great price! Very easy to assemble! High quality! Winner! Will be purchasing more in the near future! LOVE these. We have two to supplement as a dry cabinet. Great value for a nice display! Economical and still has a nice appearance. I looked at lots of plexiglass options and for the price this was the winner. I absolutely love this display case. I shopped around for a long time before finding the perfect one here. Shipping was fast and it was easy to assemble! It has made a huge difference in our coffee shop. It really highlights anything you display. It\\\'s also easy to clean. I love it! This was such a great purchase! I scoured the internet looking for the cheapest price on a 3 tier display case and this is it! I even went looking for a used one. Nope, buy a new one and buy this one! Great product very sturdy. Shipped in 2 days with regular shipping price. I am buying a second one today for my expo that is for the holiday. This has been the best display! I load it up with goodies and carry to vendor events with me. The items stay put and the half sheet parchment liners fit on the shelves perfectly to keep them clean. Super easy to clean! It keeps the products away from the elements and customers can clearly see all the delicious goodies. It definitely attracts customers and makes me look professional at vendor events. Easy to set up, spacious and great-looking product to show-case our premium Swiss chocolate truffles. Compact enough to solve the problem for our retail partners with limited counter space. I keep one in my office to show my customers the excellent quality of this product so that they can order it themselves. Love my cases. The items are clearly seen and everything stays fresh. The doors on the back are very secure and tight. Clean up is a breeze with these. We have a small coffee shop and this is perfect for what we need. Very easy to put together and makes the items look delicious. This display case is one of the best items i have ever seen for the price. They are not big and bulky and you can place them anywhere you have counter space. A very versatile item. I absolutely love this bakery display box. This is the second display box I've purchased in a matter of months. I use it to display my cupcakes at a deli in Maspeth NY. The deli owner loves the way the cupcakes are displayed and likes that it doesn't take up a lot of space on the counter. I would recommend this product to anyone in need of a classy display. This display case is a great value. Its very easy to assemble. It is very easy to keep free of fingerprints. I put all mu cupcakes and scones and such in it. I purchased this item to use in my deli. It has transformed the checkout counter to look much nice and has improved sales of my baked goods. I am now expanding my baked goods selection because of this item. Would purchase again. For the price (much cheaper than other displays), these cases are great! Each shelf holds close to 2 dozen cupcakes, and the shelves are spaced out enough to allow room for frosting, etc. I love these cases, and I will definitely buy them again in the future. Great bakery case and it holds a lot of product. It cleans very easily and looks good. Very nice product and I would recomend this product. This bakery display case is so great because of the rear doors and three trays. Not only can you reach all the pastries easily, but you can also fit a lot in there! I really love this item! I ordered 2 and have them both of them to use in my cupcake store holding other items such as cookies, rice krispie treats, etc...definitely worth the money! This is the "best" item I bought for my shop by far, I started to make and display my scones/cupcakes they have been a huge success. Its clean looking you can see all around the case.Its just wonderful. The display case shows off your product in a professional manner. The case is large enough to display at least 10 different kinds of cupcakes. I highly recommend this for dessert items. I put brownies, cookies and cinnamon rolls in mine. There is an easy clean up as well. I def. recommend. These are really convenient to have. i like this case because of the easy access doors on the back side. it makes getting your pastries really quick and easy. this has been a great item. we use it regular for display of bagels and doughnuts. Great quality. Have been using it for several years now and has held up great! it holds a decent amount of bread and pastry for a display case. great for coffee shops and any other kind of drink establishment. Great price. These are great for a non standard business, i have purchased two for my churches Back Door Cafe. The visibility for them is great, I even have one for my business. We call her Lucita! This is a great bakery case. Big enough to hold our jumbo muffins and cinnamon rolls. But light enough that I haul it on a wagon and use it at our local farmers market. Thanks! We use this display case for outside events and farmers markets. It is lightweight but sturdy. The removable trays make it very easy to clean. This is a grest display case, perfect angle of trays and enough room under the bottom tray to put a frozen gel bag to keep cooler at a good temp. I love this item. It fits perfectly on top of our bakery case and allows for us to use the shelves to display our cookies or pies. Sometimes we remove the center shelf to display our caramel apples. Easy to write on and wipe off with liquid chalk. This bakery case was everything that I wanted and needed. The case is very nice and displays everything wonderfully. I have had so many compliments on the way my baked goods are displayed and how professional everything looks. The shipping was incredibly fast as well! The only drawback is that there is assembly, but I had this together in about 20 mins. Great value! Excellent quality! Easy assembly! I had purchased the exact display case somewhere else for a lot more money. I recommend this product. Thanks Webstaurant. This little case has been perfect for our limited counter space. It holds 36 muffins, 12 scones and 24 cookies. I may add another one day when my menu expands. Not only is this the most reasonably priced pastry case we found, but it was also VERY easy to put together and displays the pastries beautifully! We fit quite a bit of goodies in there every day and would highly recommend it for a small coffee bar or bakery like ours!